Turkish Talmudist; lived at Constantinople in the seventeenth century. 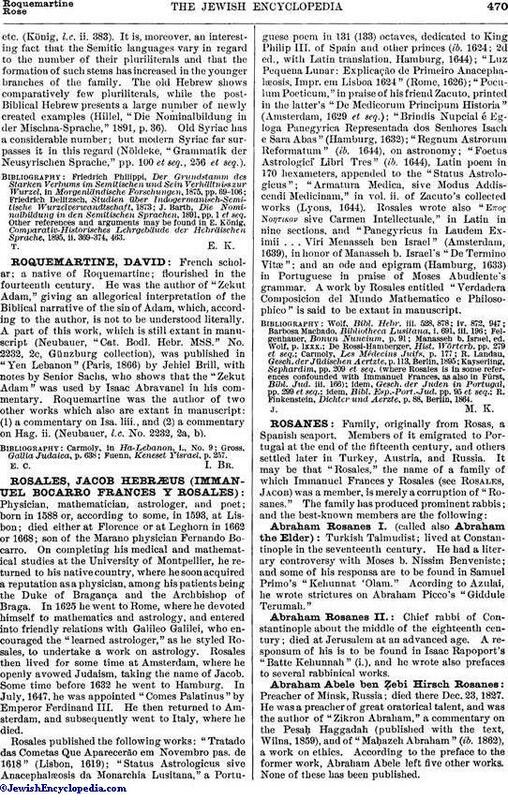 He had a literary controversy with Moses b. Nissim Benveniste; and some of his responsa are to be found in Samuel Primo's "Kehunnat 'Olam." Acording to Azulai, he wrote strictures on Abraham Picco's "Giddule Terumah." Chief rabbi of Constantinople about the middle of the eighteenth century; died at Jerusalem at an advanced age. A responsum of his is to be found in Isaac Rapoport's "Batte Kehunnah" (i. ), and he wrote also prefaces to several rabbinical works. Preacher of Minsk, Russia; died there Dec. 23, 1827. He was a preacher of great oratorical talent, and was the author of "Zikron Abraham," a commentary on the Pesaḥ Haggadah (published with the text, Wilna, 1859), and of "Maḥazeh Abraham" (ib. 1862), a work on ethics. According to the preface to the former work, Abraham Abele left five other works. None of these has been published. Bulgarian scholar; born at Rustchuk 1838; died there 1879. In 1867 he made a voyage to Palestine; and his account of that country, written in Judæo-Spanish, was translated into Hebrew by Menahem Farḥi and published in "Ha-Maggid" (xi., No. 38-xii., No. 34) under the title "Mas'ot ha-Abbir." Rosanes was the founder of a Jewish school in his native place, which he endowed with a valuable library. Rabbi of Constantinople; died there at an advanced age April 13, 1727; son-in-law of Abraham Rosanes I. His teachers in Talmud and rabbinics were Samuel ha-Levi and Joseph di Trani. On account of his knowledge of Arabic and Turkish he was appointed by the government, chief rabbi ("ḥakam bashi") of the Ottoman empire. Judah took a very active part in condemning and denouncing the Shabbethaians; and he was one of the signers of an appeal to the German communities to oppose the movement (comp. Jacob Emden, "Torat ha-Ḳena'ot," Lemberg, 1870). He wrote: (1) "Parashat Derakim" (Constantinople, 1727), a work containing twenty-six homiletic treatises on various subjects. It is followed by a pamphlet entitled (2) "Derek Miẓwoteka," a treatise on the 613 commandments, based on the treatises on the same subject by Maimonides and others. (3) "Mishneh la-Melek" (ib. 1731), glosses and comments on Maimonides' "Yad ha-Ḥazaḳah"; later it was printed together with the "Yad" (Jessnitz, 1739-40). 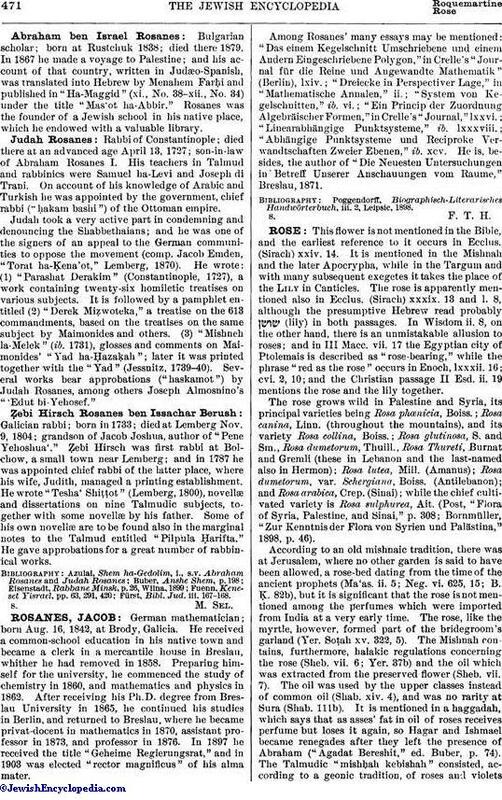 Several works bear approbations ("haskamot") by Judah Rosanes, among others Joseph Almosnino's "'Edut bi-Yehosef." Galician rabbi; born in 1733; died at Lemberg Nov. 9, 1804; grandson of Jacob Joshua, author of "Pene Yehoshua'." Ẓebi Hirsch was first rabbi at Bolchow, a small town near Lemberg; and in 1787 he was appointed chief rabbi of the latter place, where his wife, Judith, managed a printing establishment. He wrote "Tesha' Shiṭṭot" (Lemberg, 1800), novellæ and dissertations on nine Talmudic subjects, together with some novellæ by his father. Some of his own novellæ are to be found also in the marginal notes to the Talmud entitled "Pilpula Ḥarifta." He gave approbations for a great number of rabbinical works. Fürst, Bibl. Jud. iii. 167-168.